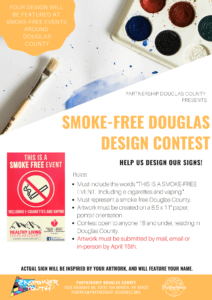 Help us design Douglas County’s Smoke Free event signs! Contest open to anyone 18 and under, residing in Douglas County. Artwork must be submitted by mail, email or in-person by April 15th.